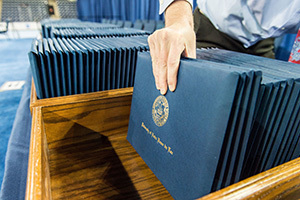 Degrees will be conferred on 2,081 undergraduates students at Notre Dame’s 172nd University Commencement Ceremony on Sunday. Vice President Mike Pence will be the principal speaker and recipient of an honorary degree. Rev. Greg Boyle, S.J., founder of Homeboy Industries in Los Angeles — the largest gang intervention, rehabilitation and re-entry program in the world — will receive the 2017 Laetare (lay-TAH-ray) Medal, the oldest and most prestigious honor given to American Catholics. Pence is the first U.S. vice president to deliver the commencement address at Notre Dame. Last year, Vice President Joe Biden received the Laetare Medal and delivered an address as the Laetare Medal co-recipient along with former Speaker of the House John Boehner. C.J. Pine, an Arabic and peace studies major who was raised in Tianjin, China, will deliver the valedictory address. Salutatorian José Alberto Suárez, a computer science and engineering major from Monterrey, Mexico, will deliver the invocation. In addition to Pence, six others will receive honorary degrees. They are former NASA administrator and astronaut Maj. Gen. Charles F. Bolden Jr.; Cardinal Kevin Farrell, newly appointed by Pope Francis to lead the Dicastery for Laity, the Family and Life, a new Vatican department that focuses on the lives of ordinary Catholics worldwide; Alice Gast, president of Imperial College London; Rev. Martin Junge, the first Latin American to lead the Lutheran World Federation (LWF) as general secretary; Philip J. Purcell III, Notre Dame graduate, member of its Board of Trustees and the founder and president of Continental Investors and retired chairman and chief executive officer of Morgan Stanley; and Martha Lampkin Welborne, also a Notre Dame graduate, who is senior vice president for corporate real estate and global facilities with The Walt Disney Co.
On Saturday, 416 students will receive master’s and doctoral degrees at the Graduate School Commencement Ceremony, along with 437 master’s degree students at the Mendoza College of Business Ceremony and 241 at the Law School Ceremony. Baccalaureate Mass, 5 p.m. Saturday, Purcell Pavilion, Joyce Center. The undergraduate college and department diploma ceremonies beginning at approximately 1 p.m. Sunday throughout campus. A complete schedule of events is available from the Commencement website. With the participation of Pence, additional security measures will be in place at the University Commencement Ceremony. The academic processional will begin at approximately 9 a.m., but guests are encouraged to arrive early due to expected delays. All guests will be required to pass through airport-style security checkpoints operated by U.S. Secret Service personnel. All attendees must have a ticket for admission. Guests can enter the stadium beginning at 7 a.m. through Gate E on the northwest side and Gate C on the south end. Many common items will be prohibited at Commencement. For a complete list of prohibited items, visit the Commencement website. Originally published by Sue Lister at news.nd.edu on May 17, 2017.